My cell phone. Which I hardly ever use. Last seen on the shelf by the front door sometime during the Christmas season. If I don't find it soon, really soon, and charge it up with credit (which I suppose I could do without actually finding it — hmmm...), I will lose my phone number. I don't understand the ubiquity of the cell phone when the terms and conditions of using one are so inconvenient. My daughter's birth certificate. Which we'll need in order to cross the border, to enjoy a planned kind-of-roadtrip, 2 weeks from now, in which the kid and I will be dropped in DC to hang with my sister. I can see it in my mind's eye — it's in a plain white envelope along with the letter from J-F granting me permission to take her cross-border; I came across it relatively recently, in a pile of documents it shouldn't've been filed with. I cannot remember if I left it there, or filed it someplace I felt it more logical to be; but it is in neither of those places. We've applied for a replacement. My Diagnostic and Statistical Manual of Mental Disorder, 4th edition, desk reference. It used to sit right beside the American Psychiatric Association glossary. I know I used it, for reference, last spring. My boss last week asked me if I was familiar with it, would it have the info required for one of the projects we're working on, maybe we should get one for the office. I offered to bring mine in. I've spent far too much time looking for it. We've ordered a copy for the office. In a general way, I'm bothered that I'm unable to find (to buy) a replacement for the black beret with the black embroidered stylized flowers that I lost a few months ago, between my office and the metro, all of a 2-minute walk, indoors. Months ago, and I'm still bothered. I always know where everything is. More than anything, I'm bothered by these lapses in my attention. As I've begun to weed, inevitably covers are drawn back, pages are turned, and snippets are read. While this is mostly an act of instinct, a lack of self-control, it is, on the whole, useful to the decision process. Some books I don't remember reading at all; I just remember liking them. What do I do with those books? This is the all-new Remington SL3, the machine that answers the question, "Which is harder, trying to read The Brothers Karamazov while listening to Stevie Wonder records or hunting for Easter eggs on a typewriter keyboard?" This is the cherry on top of the cowgirl. The burger served by the genius waitress. The Empress card. I sense that the novel of my dreams is in the Remington SL3 — although it writes much faster than I can spell. And no matter that my typing finger was pinched last week by a giant land crab. This baby speaks electric Shakespeare at the slightest provocation and will rap out a page and a half if you just look at it hard. "What are you looking for in a typewriter?" the salesman asked. "Something more than words," I replied. "Crystals. I want to send my readers armloads of crystals, some of which are the colors of orchids and peonies, some of which pick up radio signals from a secret city that is half Paris and half Coney Island." He recommended the Remington SL3. My old typewriter was named Olivetti. I know an extraordinary juggler named Olivetti. No relation. There is, however, a similarity between juggling and composing on the typewriter. The trick is, when you spill something, make it look like part of the act. How do I discard a book that starts like that? "To thine own self be shoe." I'm not sure who the madman is, and I'm still thinking about what it means to dream of Turing machines. A Madman Dreams of Turing Machines is by cosmologist Janna Levin, and it's lovely. Potential madmen dreaming: Kurt Gödel, Alan Turing, and Levin herself. This reader, too. Dreaming, perhaps, of some quintessential truth, just beyond reach. He is still all potential. The potential to be great, the potential to be mad. He will achieve both magnificently. Everyone gathered on this Thursday, the rotating numbers accounting for some three dozen, believe in their very hearts that mathematics is unassailable. Gödel has come tonight to shatter their belief until all that is left are convincing pieces that when assembled erect a powerful monument to mathematics, but not an unassailable one — or at least not a complete one. Gödel will prove that some truths live outside of logic and that we can't get there from here. Some people — people who probably distrust mathematics — are quick to claim that they knew all along that some truths are beyond mathematics. But they just didn't. They didn't know it. They didn't prove it. Gödel didn't believe that truth would elude us. He proved that it would. He didn't invent a myth to conform to his prejudice of the world — at least not when it came to mathematics. He discovered his theorem as surely as if it was a rock he had dug up from the ground. He could pass it around the table and it would be as real as that rock. If anyone cared to, they could dig it up where he buried it and find it just the same. Look for it and you'll find it where he said it is, just off center from where you're staring. There are faint stars in the night sky that you can see, but only if you look to the side of where they shine. They burn too weakly or are too far away to be seen directly, even if you stare. But you can see them out of the corner of your eye because the cells on the periphery of your retina are more sensitive to light. Maybe truth is just like that. You can see it, but only out of the corner of your eye. Where is God in 1 + 1 = 2? Nowhere. Over the coming days and weeks and on into months, he feels the last of his spiritualism evaporate like the cooling remains of a fever. He is left without remorse and wonders how he ever clung to his awkward faith with such emotion. We're just machines. At the age of twenty-three and for the rest of his life he embraces, without reservation, a mathematics that exists independently of it. We are biological machines. Nothing more. We have no souls, no spirits. But we are bound to mathematics and mathematics is flawless. This has to be true. Where is God in 1 + 1 = 2? There is no God. To his great surprise his materialism is not so sad. He moves with greater ease and resilience and less fear. It is as though his eyes have suddenly come into focus from a nauseating blur and the whole world looks brilliant. All of his senses have sharpened so that colors and sounds and smells and textures are splendid and vibrant, his experience of them a heart-soaring joy. Every blade of grass glistens. The hard Cambridge wind batters respect out of him. The barren twist of every branch of every tree, even the weak fog of light, the whole of the world sings out to him as though he has never seen or heard anything before. With the sheer pleasure of this tactile awakening, his love of nature intensifies as though he has finally given over to her, wholly and without inhibition. Within days his spiritualism is no more than a mildly embarassing, childish memory. In its place is a calm, impervious materialism — nothing like the sad bleak emptiness he feared. He would have a bad time trying to put it into words. No single word could mean this thing. He would have to write something lengthy with many caveats and tangents and even then he knows he would not successfully express the immediacy or the splendor of the visceral experience. Maybe in another's mind better words would come, but not in his. And so his mind offers him something simple. Only one word comes to him over and again, and it could be only this — a word he doesn't often think to use: "beautiful." It is beautiful. I won't pretend to know what this book actually means or what it aspires to do, beyond speculating as to the character and thought of these two eccentric minds, but it's quite beautiful. This is a fictional account of the lives of Gödel and Turing. There is no hard math here. The philosophical concepts Gödel and Turing played with are presented quite simply and often tangentially. There is no direct relationship between Gödel and Turing. Turing's work drew on Gödel's ideas, but they never met. But parallels are drawn, perhaps no more complicated than the fact that these are two geniuses firmly detached from reality. The story is told with a cool detachment, which proves to be highly poetic. Review by M John Harrison. Interview (Quirks & Quarks, CBC) (mp3). Levin: Something I find particularly interesting is that science, I think, is the last realm in which people talk to each other seriously, with a straight face, about beauty. Visual artists would never say that's a beautiful piece of work, not in really contemporary, cutting-edge art. Lethem: That's a very difficult phrase. After modernism, beauty is terrifically suspect. Levin: Right, absolutely. And it's considered kind of provincial to aim for something beautiful. We're not doing pretty pictures here; we're doing something else. But in science, we really hold on to beauty and elegance as the goal because, for reasons that I think nobody fully understands, it's a good criterion for distinguishing what's right from what's wrong. And if something is beautiful and elegant, it's probably right. Occasionally, you'll see something that's so beautiful and so elegant, and it's not right, and you can't believe it's not right. I've decided to weed my books. There's just not enough room. There is various shelving around the house, for the kid's books, for cookbooks, for colouring books, for board games, for dictionaries and the atlas. But 4 bookcases are mine, and they're bursting at the seams. More bookcases is not an option. Books by some authors I will not part with, such as Calvino, Saramago. I have duplicates of Douglas Adams, and of 1984. I don't think I will ever read Anna Karenina again; if I do, it will be in a different translation. I'm keeping Bridget Jones's Diary, but not the sequel. Will I ever read this book again? Really, that one question ought to do it. The discards are accumulating. But. But this hoarding of books is an unreasonable compulsion, and it's a tough habit to break. I find excuses. Did this book have a significant impact on me? Will I ever have reason to refer to it? Do I have a strong sentimental attachment to this particular physical specimen (for my notes, an inscription, a memory)? Is it a book that is exceptionally hard to find? Will I regret having disposed of it? Should I keep it for Helena's sake, to tempt her, to guide her literary discoveries? I discarded The Children of Men, but then I created an exception for all books fitting the category of u-/dys-topian fiction (if anything's my thing, that's it), so I pulled it back. There's the broad category of, umm, "esoterica" — for lack of a more precise, overarching label — (Schulz and Gombrowicz; Breton and Appolinaire; Perec and Pavic), some samples of which fit my criteria, others not quite. I don't know what to do about The Martian Chronicles — I bought this paperback at a garage sale for 50 cents, after having spent weeks looking for a copy, overwhelmed with the need to reread it, having no idea whatever happened to my own. If I put this copy in the box, will I be able to find it at a garage sale when I need it? And, seriously, what of the impact on the child? I did not grow up in a home with shelves of books. I relied on libraries and instinct and gifts for literary guidance. For better, or worse? Do I keep Dracula, Frankenstein, Ayn Rand (oh, come on — every adolescent goes through an Ayn Rand phase) just so the kid might "discover" them earlier? Or would she then snub them as her mother's books? If I dispose of them, will they be out there for her when she's ready for them, will she be able to find them, will she know that they exist? I used to imagine I'd grow up and have a house with library. But life happens, and I'm letting go. A few weekends ago I went to the hospital. I thought my brain was going to explode. I get migraines quite regularly, and I've learned to cope — some ibuprofen at the first signs and a couple hours' sleep in a dark room as soon as the day-to-day allows will usually head it off. But they've been getting worse over the years. I'd been battling a virus, even worked from home that Friday, as the effort of wearing something other than pyjamas just seemed a bit much that day. Was it a migraine I felt coming on? The pain of it woke me up; the pain of it had me throwing up for hours; the pain of it had me clutching my head and walking round in circles, scared that my eyeballs might squeeze out or that I'd start bleeding from the ears. This wasn't normal. Of course, at the emergency room they couldn't simply shoot me up with drugs, much to my chagrin; they had to ascertain what was the matter with me. Why do you say it's a migraine? Because, well, it's like a migraine, only it's so much worse I thought it might not be. Have you ever been diagnosed with migraine? No. Have you seen a doctor about these headaches? Uh, no. How long have you had these headaches? As long as I can remember. Just how bad are these headaches? I'm pretty much incapacitated for a couple hours — the light is screaming, I want to throw up, sometimes I throw up, I have to sleep it off. Your mother never took you to doctor for these headaches? Uh, no. Various swabs and bloodwork, extracting a sample from inside my sinuses, some basic neurological tests. A CT scan — more frightening than ever I imagined it to be. I faced it alone, J-F having just then gone off to address the parking situation. Like some wierd ancient relic of technology with a Myst-like drone. I never felt my heart beat so hard. What happens if I move my head? if I twitch? I feel a twitch. My heart is going to leap out of my throat. Will I disintegrate or explode? The doctor can't tell me anything I don't already know: It's "just" a migraine. You obviously have some virus; that must be making it worse. She offers me an intravenous painkiller, but 8 hours on, that seems like overkill. (But oh, I would've killed for some earlier.) She gives me some antiinflammatories and sends me home. I want toast. And I'm unreasonably — it's completely backward! — afraid to sleep. I've been referred to a migraine clinic. An xbox 360 has recently been introduced into the household. I am unreasonably upset over the fact that I can't play Fable as a female character. I am unreasonably obsessed with the Ratatouille demo, which is unreasonably hard. Last weekend, Helena started making valentines for all her classmates. Make a list, select a card, match an envelope, line them up, choose a chocolate, line them up. Write a name, cry, "Mommy, can you write "R" for me?," learn to write "R," select a new card, write "R" perfectly. Add a sticker, add matching stickers to the envelope, cry because they're not symmetrical, find another envelope, write the names all over again, stuff the envelope with a card, a candy, a chocolate, seal it with a sticker heart. We do this for hours. All day. And the next day too. Everything is pink and red. I've spent every day since telling Helena, really, I think it's too early, we can't deliver them just yet, Valentine's Day isn't for more than another week, no one will even recognize what it's for, wait, didn't you forget someone on your list, you can't take them till they're all ready, you can't take some for some kids and leave one little girl out, that wouldn't be nice, it's still too early, if you take them now what will you have for your friends on Valentine's Day, maybe you should wait. I buy some time: one morning I suggest we take the leftover gummie hearts — we can leave one for everyone in their cubbyhole. She may have finally forgotten about the cards. I've been reading faster than I can document it. No, not exactly — I'm managing to find time to read, at the expense of sleep, but can't find time or energy to write about it. Which is a shame, because The Painter of Battles, by Arturo Perez-Reverte was extraordinary, even though I don't think it exactly works as a novel; it's a powerful meditation on both art and war, and I recommend it highly. 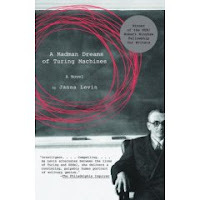 Also read last week: A Madman Dreams of Turing Machines, by Janna Levin, of which I'd known absolutely nothing but to which I was committed it from the moment I read its title. Madman! Turing machines! Actually it's a fictional account of certain events in the lives of Kurt Goodel and Alan Turing. Geeky mathematicians! "If the world were to end tomorrow what book would you read today?" is the question posed at Reading Matters. Answer: the book I've just passed the midway mark of: Zig Zag, by José Carlos Somoza, a real page turner! (What if you could, with complex camera arrangements based in string theory, see the past?) That is, the end of the world wouldn't change my reading habits at all, except that I'd probably have no time for reading, what with engaging in wierd and complex craft projects with a 5-year-old and trying to recpture some romance with my other half before it all goes up in smoke, but I'd really, really like to know how this book ends. I should go find out now. The European Commission's "Group of Intellectuals for Intercultural Dialogue," chaired by Amin Maalouf, one of my favourite writers, this week delivered its report on its discussions on the contribution of multilingualism to intercultural dialogue. The report — A Rewarding Challenge: How the Multiplicity of Languages Could Strengthen Europe — according to the press release "makes proposals on how languages can foster intercultural dialogue and mutual understanding, establishing a clear link between linguistic diversity and European integration." There are some introductory comments on the question of identity (a matter on which Maalouf has previously written eloquently about) and a discussion of the general implications of what it is to live in community of 23 official languages, with the basic conclusion that everyone ought to learn another language. Simple. For the people of Europe, old and young alike, intensive and in-depth knowledge of a language and all the culture that it transmits is a major factor of fulfilment. In a civilisation in which communication is becoming so important and in which there is an increasing amount of free time, to add to one's existence this exploration of another linguistic and cultural universe can only bring enormous professional, intellectual and emotional satisfactions. particularly as, in his or her relations with the speakers of the personal adoptive language, a European citizen would naturally tend to extend to them knowledge of their own country and their own culture. monolingualism is probably much stronger than elsewhere. Without a special effort to promote, from the very earliest age, the intensive learning of an additional language, the advantage which English speakers today have would rapidly become eroded, and the globalisation of their mother tongue would have an adverse effect on their competitiveness at both individual and collective levels. This paradoxical pattern of events was stressed in no uncertain terms in a recent study commissioned by the British Council. It might perhaps be worth stressing here that some Europeans should obviously choose English as their personal adoptive language, following the example of Joseph Conrad who was of Polish mother tongue, had French as a language of international communication, and became one of the greatest writers of the English language. It is important for English to retain and consolidate the eminent place it holds as a language of culture rather than being straitjacketed in the role of instrument of global communication, a flattering but detractive role, and one which is potentially a factor of impoverishment. How many languages do you know? What is (would be) your personal adoptive language?